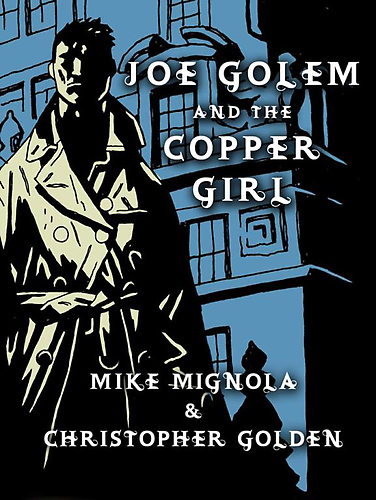 Joe Golem and the Copper Girl is a prequel of sorts to Joe Golem and the Drowning City. Christopher Golden and Mike Mignola have been having some real success in storytelling through comics, short stories, and illustrated graphic novels, and I’m having fun trying to keep up with all of them. Their Hellboy stuff and Lord Baltimore tales (soon to be a movie, I think) have been fun. The short story introduces Joe Golem, the legman for Simon Church, a mix between Nero Wolfe and King Arthur’s Merlin, I’m guessing from this short story. As an introduction to the characters and the sunken city of New York, the tale is a melancholy and bucolic treat for the imagination – as long as part of your imagination doesn’t mind traveling through lands occupied by things only H. P. Lovecraft could have dreamed up. At the beginning, the narrative is a little stiff and wooden, but the creators have a lot of ground to cover to build up their world, and the overall effect is interesting enough to forgive the wandering introduction. Once the authors get to the situation, things move along quickly. The weather plays an important part in setting the mood in this story, and I enjoyed that quite a lot as well. How can you not get sucked into a storm-twisted world where all manner of evil things can happen? The story doesn’t end up as straightforward as the casual reader would expect. There are some nice twists and turns along the way. Although the tale starts out slow off the blocks, I was totally sucked into things by the time I was flipping through the final pages. I liked Joe Golem well enough in this story, but I also saw there is more to him. I’m looking forward to getting to know him and his mysterious boss more in the novel. This entry was posted on July 25, 2012 at 5:14 am and filed under Adventure,Comics Related,Crime,detective,Mystery,Noir,Novella,Paranormal,series fiction,Young Adult. You can follow any responses to this entry through the RSS feed. You can leave a response, or trackback from your own site.